Successfully finishing a medical residency is a significant milestone in any physician's career. But when Natalie Ertz-Archambault, M.D., graduated in June 2016 from the Internal Medicine Residency at Mayo Clinic's Arizona campus, the achievement felt particularly sweet. "It was an incredible success for me, since I actually started my residency in 2012, completed four months, and then became too ill to work," she says. "At that time, I wasn't sure if I'd ever reach graduation." Uncovering the cause of Natalie's illness took time and careful investigation. When she received a diagnosis, Natalie was surprised to learn she had vascular Ehlers-Danlos syndrome. This rare genetic disorder makes the body's hollow organs, including the blood vessels, digestive tract, bladder and uterus, fragile. It can lead to severe complications, such as blood vessel injuries, that require close monitoring. After eight months of medical care, Natalie was able to resume her training as a resident physician. Looking back, she sees the experience has changed her, not only personally, but professionally as well. "I returned to my residency knowing what it's like to be sick, what it's like to have a life-threatening illness, and, honestly, what it's like to have a rare disease that doctors know little about," Natalie says. "I also saw what a difference it can make when you have physicians who are willing to advocate for you, who don't feel limited to just their particular specialty. That's the kind of care I want to give to my own patients." When Natalie's health began to decline, her symptoms were ambiguous. In December 2012, a month after she was forced to leave her residency due to poor health, doctors thought she had a kidney stone. But her symptoms got worse, and Natalie was concerned something else was going on. In February 2013, Natalie made an appointment to see Mayo Clinic nephrologist Leslie Thomas, M.D. He assessed Natalie's condition and was concerned by blood pressure readings that were very high. "There weren't boundaries to the care Dr. Thomas was willing to provide … I got the care I needed in a seamless way." 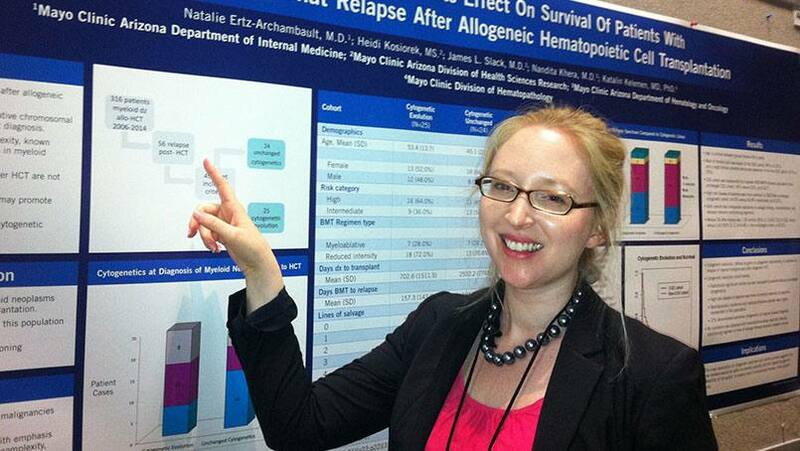 – Natalie Ertz-Archambault, M.D. Dr. Thomas suggested imaging exams of Natalie's kidney vessels. Those tests revealed the first clue to what was really happening. In one of Natalie's renal arteries — the main blood vessels that lead to the kidneys — layers of the artery's walls had separated. This condition, called renal artery dissection, makes it hard for blood to flow through the artery properly. It can cause kidney damage and high blood pressure. If left untreated, the dissection could have spread to the large artery that's connected to the renal arteries, called the abdominal aorta. Dissection in that artery can be life-threatening. In a discussion with Dr. Thomas, Natalie mentioned one of her family members had vascular Ehlers-Danlos. With that in mind, and concerned about new neck pain Natalie had developed, Dr. Thomas recommended more imaging. It showed additional dissections in Natalie's internal carotid arteries, two large vessels that deliver blood to the brain. Genetic testing confirmed she had the gene mutation for vascular Ehlers-Danlos syndrome. Although her diagnosis was not what she had been hoping for, Natalie was relieved to know the reason for her health problems. She was also grateful for Dr. Thomas's persistence in finding the answer for her. "Initially, my condition wasn't very straightforward. There were some abnormalities that weren't easily explained," Natalie says. "Dr. Thomas walked me through all the possibilities. He really listened to me and gave me sense of calm." Natalie says. She also appreciated the thoroughness of the evaluation she received as they were trying to arrive at an explanation for her medical concerns. "There weren't boundaries to the care Dr. Thomas was willing to provide," Natalie says. "Even though I was visiting my nephrologist, he saw to it that I got the imaging of my head and took responsibility for the result. I got the care I needed in a seamless way." "The Mayo Clinic Model of Care, where specialists from different areas work together, was exactly what I needed." – Natalie Ertz-Archambault, M.D. After her diagnosis, Natalie spent several days in the hospital as her multispecialty team monitored her condition. In addition to Dr. Thomas, Fadi Shamoun, M.D., a Mayo Clinic cardiologist, and Richard Fowl, M.D., a Mayo vascular surgeon, played key roles in her care. "A multidisciplinary approach is absolutely essential to successful management of this rare condition," Natalie says. "The Mayo Clinic Model of Care, where specialists from different areas work together, was exactly what I needed. Mayo Clinic was definitely the place for me and my family to be." A critical first step in Natalie's care was to lower her high blood pressure. Doing so took some of the strain off her arteries, allowing the dissections to start to heal. It also eased the workload that the high blood pressure had placed on her heart and kidneys. As those organs returned to normal functioning, the vague symptoms that had been plaguing Natalie for months slowly disappeared. Natalie was able to resume her residency in July 2013 and successfully completed her training three years later. Although she feels well now, Natalie understands that vascular Ehlers-Danlos is not something she can leave behind. "From a health perspective, I'm doing great. I take blood pressure medication, and that's it. But my condition is not going to go away. The risks are always there in my genes. Awareness of this diagnosis is key to survival," she says. Although she knows she'll live with her condition for the rest of her life, Natalie is not allowing it to limit her. She looks forward to the prospect of putting her medical training and her own experience as a patient to work for others. "I consider myself blessed with so much opportunity in this life. It is a privilege to return to medicine and do what I truly enjoy." – Natalie Ertz-Archambault, M.D. "I consider myself blessed with so much opportunity in this life. It is a privilege to return to medicine and do what I truly enjoy," Natalie says. "I feel I have a calling to help other people, especially patients with cancer. I can make a difference in their lives and be their advocate without boundaries, particularly when they cannot advocate for themselves." As she continues her career, Natalie plans to apply for fellowships in hematology and medical oncology. Eventually, she hopes to return to Mayo Clinic. "The Mayo Clinic Model of Care is the kind of care I will always strive to deliver as a physician," she says. "I will never forget what it is like to receive that seamless standard of care. Among the many fantastic physicians I encountered as a patient, I especially have Dr. Thomas, Dr. Shamoun and Dr. Fowl to thank for an extraordinary experience." Learn more about Ehlers-Danlos syndrome. Learn more about residencies and fellowships at Mayo Clinic. Explore the divisions of Cardiovascular Diseases and Vascular and Endovascular Surgery. Connect with others talking about living with vascular conditions on Mayo Clinic Connect. Such a great achievement, I love the perseverance and determination. Honored to say that I’ve worked with a few people on this list.